Another childhood classic that has been played for centuries, and probably needs no extra explanations, but provides significant learning opportunities to stimulate the mind. Domino tiles are usually twice as long as they are wide and have a line in the middle dividing them into two squares. In the most common variant the values of each tile is a certain number of dots, usually from 0 to 6, hence the most common use of dominoes to reinforce the numbers. Newer versions of the game often include all kinds of pairs that can be matched, and that’s where dominoes come in handy in language lessons. The dominoes are distributed among players. One player begins by playing the first domino, and the others continue by laying tiles with matching ends. If a player doesn’t have a card to play, it is the next player’s turn. The winner is the player who first plays all of their cards. Picture card to another picture card – The pictures don’t have to be the same, they should just relate to one another, in order the students can recognize they’re pairs. Again, it’s important not to forget to say out loud the words represented by the picture cards. The game is suitable even for the youngest, who still can’t read. Picture card to text card – In the simplest version, a picture to the written word, and we can slowly pass on to a higher level by introducing short descriptions that will lead us to think of the picture. It is highly recomendable to start introducing this kind of association based texts, even in the beginners’ level, to enhance intuitive ways of learning and understanding. Text card to another text card – Also suitable for a bit advanced learners, for example to help them practice singular and plural form, opposites, present and past tense, or we can play even with complete sentences that are describing the same thing in a certain way. If you want to prepare your dominoes game with your PetraLingua flashcards, simply use the Memory Game Template we published in our previous post. Decide how many tiles you want to play with and print the needed number of templates. Then mark the “Start” and the “End” field. Print out the cards of the theme you want to practice and put (glue) them in the correspondent fields and cut the templates into tiles. 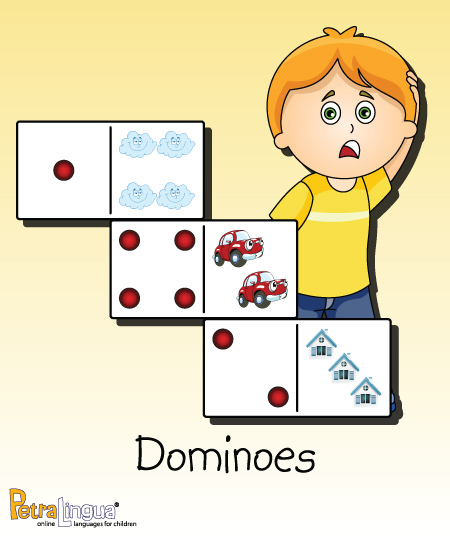 We have prepared this cute Numbers and Animals Domino Game Suggestion to help you practice your numbers and animals words. Have a great game and be sure to let us know who won!